Guru Dev Singh is a great man of moral stature and compassion. 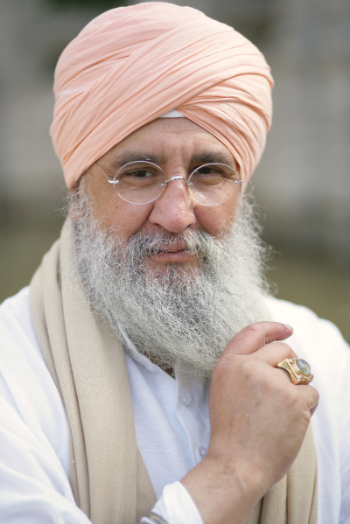 A Sikh and disciple of Yogi Bhajan, Guru Dev Singh was born in Puebla, Mexico in 1948. He felt the call to study the indigenous traditions of his country which had started to spread and become popular among youth in the 1960′s and 1970′s and which still exert a certain ascendancy today. A Totonaca indio chose him as a disciple and taught him to look. “To look” means being able to see the cosmological meaning of reality through understanding the relationship among all the things existing in the Universe. In the Mexican Totonaca tradition the teaching happens in silence: the student “follows” the teacher everywhere he goes until understanding descends. Guru Dev Singh began to practice Kundalini Yoga in 1971. In 1976, he met Yogi Bhajan and in 1978 he began learning Sat Nam Rasayan under him, by following the traditional method of silence. The lesson was learned while he was close to his teacher, Yogi Bhajan, who would then follow silence by speaking about domestic matters, politics or business. In this way Yogi Bhajan knew exactly what and how much his student was learning. One day, Guru Dev Singh’s state of consciousness went through an alteration and he connected unequivocally to the Sacred Space. Yogi Bhajan understood immediately and quit the teachings. Both of them knew what had happened but did not speak about it for many years later. In 1981, Guru Dev Singh embraced the Sikh life and spent many years healing through Sat Nam Rasayan. In 1988, Yogi Bhajan spoke to him for the first time about the experience of connection to the Sacred Space and asked him to found a school where he could teach the healing method orally. Guru Dev Singh moved to Rome and started a pilot class. In 1992, Yogi Bhajan traveled to Rome and informed Guru Dev Singh that from that moment forward he would be responsible to keep the Name and Lineage of Sat Nam Rasayan. Guru Dev Singh took on the role of master and became part of the Golden Chain. On that day, Yogi Bhajan stated that the method would be officially known as: “Sat Nam Rasayan”.